– Feature Article – Cheater Bars – Do They Work? Cheater Bars – Do They Work? Many years ago, the predominant commercially available track was equipped with a simple starting mechanism. The starting pins were attached to a board which was held in place by rubber bands. To start the race, the operator would rotate the board. Thus, the speed of the operator’s movement determined the speed at which the pins would drop. Of course, this speed varied from heat to heat. 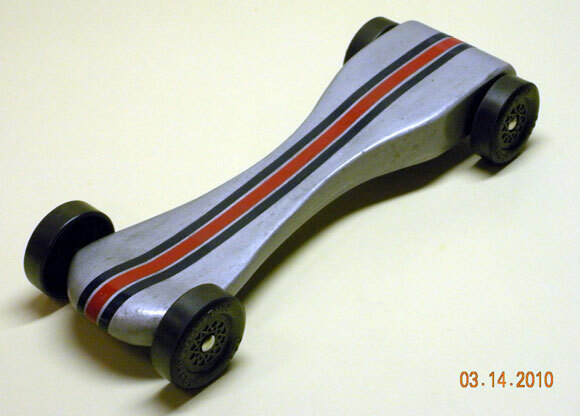 It wasn’t long before some clever derby car builders realized that by having the car contact the starting pin at a higher point, the car would start more quickly. In fact, this advantage would be significant whenever the operator rotated the board slowly. So, the “Cheater Bar” (also known as a “Spoiler”) was born. Today, starting gates are spring loaded. So, the pins fall rapidly, with a consistent speed, and the speed of the operators hand is not a factor. However, the Cheater Bar concept has continued to be viewed as a way to gain an advantage. In fact, many races ban cars which have a starting pin contact point higher than a set value. Considering that most racers will run on tracks with spring-loaded gates, and the pins on these gates drop very rapidly, is there any benefit to a Cheater Bar? Let’s find out. A cheater bar is normally a metallic attachment to the front of a car that causes the car to contact the starting pin at a higher than normal location. This can be implemented in several ways. One way is to form the bar out of a piece of coat hanger wire. Note the notched front end on the car. This is necessary to ensure that the car only contacts the pin on the bar. Also, the Cheater Bar in the above photo is missing a vital piece. In order for the bar to trip the sensor on an electronic finish line, some opaque material (usually tape) would be wrapped around the bar. A similar technique is to design the car with the wood creating a high front end (see Figure 3). Although the High Nose will provide the same theoretically fast start as a Cheater Bar, the aerodynamics will be somewhat compromised. For this experiment a Cheater Bar was implemented in a different way. 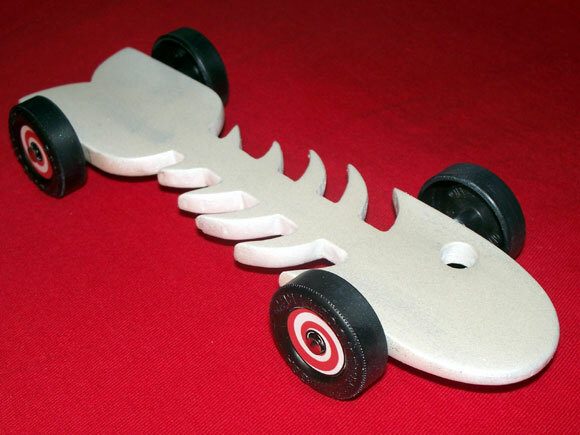 To minimize the number of factors that could affect the results, an adjustable Cheater Bar was attached to a car. The Cheater Bar was fashioned out of a piece of aluminum plate, two pieces of coat hanger wire, and a small segment of rubber tubing. The metal plate was held in place by rubber tubing, so it could be slid up or down. During the experiment, nothing was changed on the car except for the height of the metal plate. Tests were run on a thirty-two foot Aluminum Freedom Track. The car was staged identically for each run. 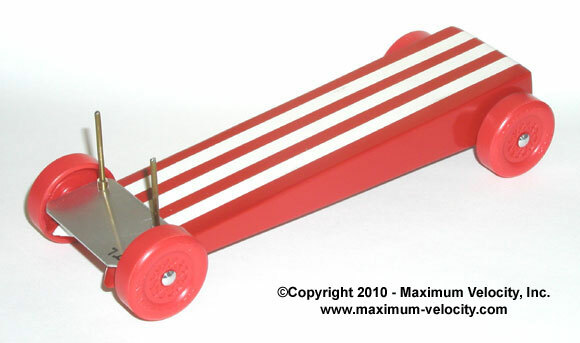 Five runs were made with the Cheater Bar set at 1-1/2 inches above the track (maximum for the starting pin). Then five runs were made with the bar set at 13/16 inch (low as possible on the car). These tests were then repeated, for a total of ten runs per configuration. Thus, the experiment shows that the position of the Cheater Bar did not affect the heat times. (The one-thousandth deviation in average times was well within the Standard Deviation of the data). So, if you will be competing in a race that will be run on a track with a spring-loaded starting gate, don’t bother with a Cheater Bar. It won’t give you any advantage, and may cause your car to receive greater scrutiny or to be disqualified. On the other hand, if you are in charge of a race that will be run on a track with a spring-loaded gate, then don’t worry if a car has a Cheater Bar. It won’t provide any advantage. My grandson and I built this car for this year’s Cub Scout race. He won 1st place in his den and 1st overall in the pack. There is nothing very different from the standard wedge shape, except for the fact that careful planning and tweaking every detail pays off. I got the design idea from your site. The size and weight was the standard BSA specs. The paint was Rust-oleum silver and the navy blue and red stripes are cut from sheets of stick-on sign vinyl. This was our first year to win 1st place overall! Thank you for tips and supplies from your site. 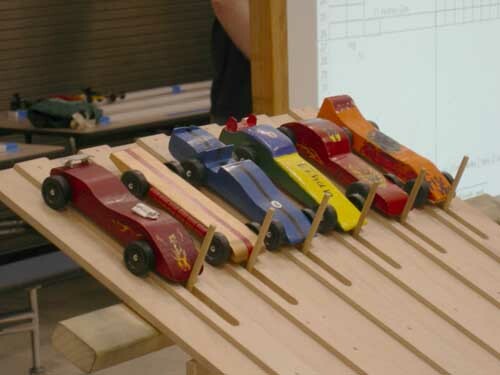 All our pinewood derby efforts culminated at the Oahu Makahiki Pinewood Derby this last Saturday. I made a Raptor kit for the Outlaw race. Joshua decided he wanted to be in the Outlaw race as well, so he made an extended Predator. It worked out great and he still was able to throw in some style. Race results? Well there are 2 families (Nakano & Oshiro) who usually have the fastest speeds in the regular Cub races as well as the Outlaw race, so for our first Outlaw race, we are happy to have placed 4th & 5th out of 19 participants. 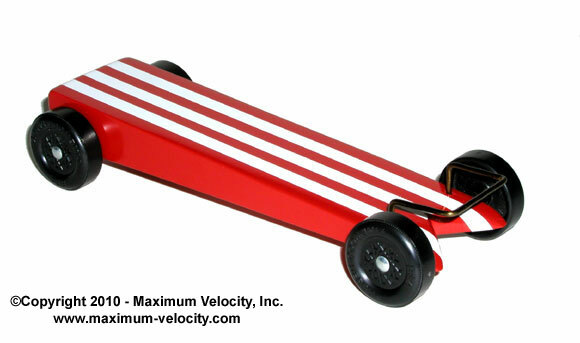 We’ve always tried to find a winning combination of speed and “cool” designs. After all when the race is over, the cars (and memories) will be kept for a long time! Thank you for your help and advice. The newsletters on your site have been helpful too. Also, I must thank you for your reliably quick shipping or Joshua would not have had time to make his entry. We were scrambling to get his done in a week! 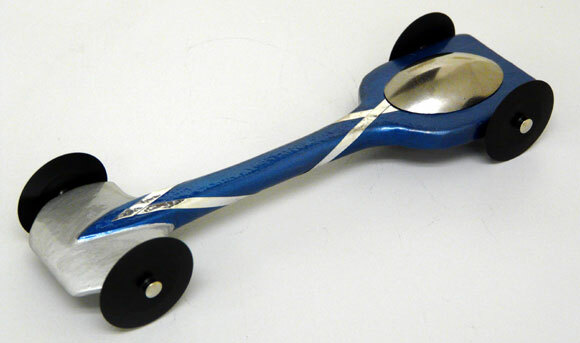 This is the car I built this year with my granddaughter for her powder puff derby in Girl Scouts. We call it Fishbone. It is only 1/4 inch thick (less after sanding), weighs in at 5.0 with a balance point of 3/4 inch and is setup for rail riding. It has 3.9 ounces of tungsten cubes hidden inside. 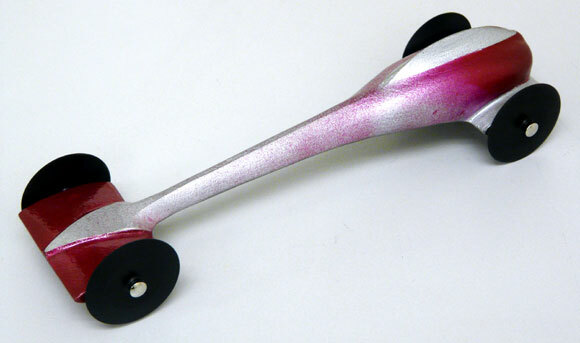 We used ultralight wheels and grooved axles. It was very fast. Nobody even came close to us. Our best time was 2.516 seconds on a 35 foot aluminum track. This is only our second car and she won grand champion again, two years in a row, using mostly your tips, your tools and your parts. We will be a customer for many more years as I have a new grandson who will be in the scouts too. Thanks for all the help. I sometimes see a car come from behind to win a race, sometimes very close to the finish line. My car came from behind twice to win in the pack race which we eventually won. I understand why we maintained our speed but I can’t figure out how those other two cars got ahead of us in the first place. 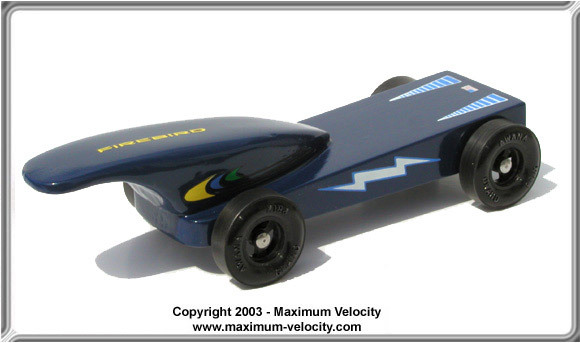 Is there an absolute, ideal weight for a 32 foot track or will a five ounce car always beat a lighter car (all other things being equal)? 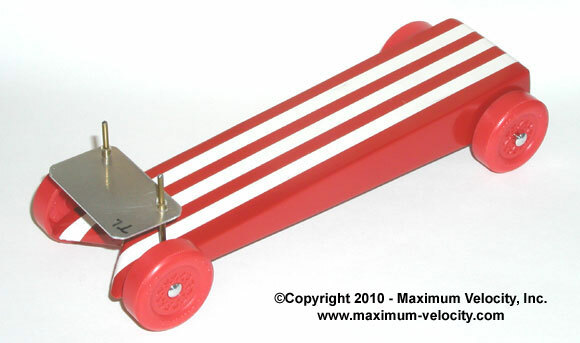 On a track with a slope, followed by a flat section, running at the maximum weight (usually 5 ounces) is generally best. But if you race on a track with a continual slope from start to finish, the best weight may be different. I have a question about the treatment of the current BSA wheels. Why does recessing the wheel’s collar where the axle head touches it, improve performance? It seems to me that by increasing the contact area between axle head and wheel we are increasing friction. Please set me straight. Removing the outer ring on the hub assumes that the axle head is beveled. If you don’t remove the outer ring on the hub, then the wheel hub will contact the beveled axle head at the outer rim (not desirable). But if you remove the outer ring on the wheel hub, then the hub will contact the beveled axle head near the shaft (desirable). If you don’t bevel the axle head, then you can leave the outer ring of the wheel hub intact.